Patrick Stewart and Ian McKellen star in Pinter's comedy. What is the Story of No Man’s Land? Set in a stately house in Hampstead (presumably—in No Man’s Land, we’re never exactly sure what is what), upper-class writer Hirst invites his old college friend (or is he?) Spooner home for a drink. When Foster and Briggs—presumably Hirst’s bodyguards—appear, they insult Spooner and try to keep Hirst away from him. As Hirst becomes increasingly inebriated, he recognizes Spooner as an old classmate from Oxbridge, but as the duo swaps unbelievable stories, Hirst begins to expect Spooner is an imposter. In Pinter’s 1974 existential drama, Hirst and Spooner continue to drink and parry, falling deeper and deeper into the void they call No Man’s Land. These accomplished vets—two Brits, two legends, two knights—make a fine pair of performers, and it’s a joy to watch them work together, polished, sure, and at ease in their roles, playing off each other and clearly enjoying themselves. In this production, Stewart and McKellen play the roles they seem born to play. Stewart uses his noble profile and plummy voice to lend gravitas to Hirst, who springs to life in the second act to engage McKellen’s puckishly charming Spooner in a duel of wits. What is No Man’s Land Like? 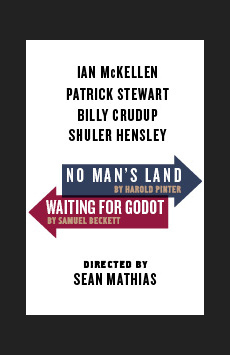 Featuring the incomparable duo of Sir Ian McKellen and Sir Patrick Stewart, No Man’s Land is currently playing in repertory with Waiting For Godot. Directed by Sean Mathias, No Man’s Land invites audiences into Hirst’s cavernous sitting room for drinks and conversation…whether or not the stories are true isn’t always clear. McKellen and Stewart inject a singular brand of humor into Pinter’s minimalistic dialogue—it’s a rare treat to watch two masters at work. Clocking in at 2 hours and 10 minutes, No Man’s Land is a splendid night trapped in the void. Is No Man’s Land Good For Kids? No. Unless your child is fascinated by abstract, existential drama, No Man’s Land is likely to go right over his head. Older teens, especially fans of Stewart and McKellen, are more likely to enjoy the production.